Of the five extant species of rhinoceroses, white and black rhinos are the only two that are native to Africa, where they are one of the "Big Five" animals sought by safari-goers. Second in size among land mammals only to elephants, white and black rhinos long have been hunted for their horns. The most important distinctions between the two species stem from differences in their diets. The major difference between black and white rhinos lies in the function and shape of the upper lip. Both are exclusively herbivorous, but white rhinoceroses are grazers, which means they feed on grasses, while their black counterparts are browsers that eat leaves and fruits off the branches of trees and shrubs. The upper lip, therefore, is flat in white rhinos and pointed in black rhinos. 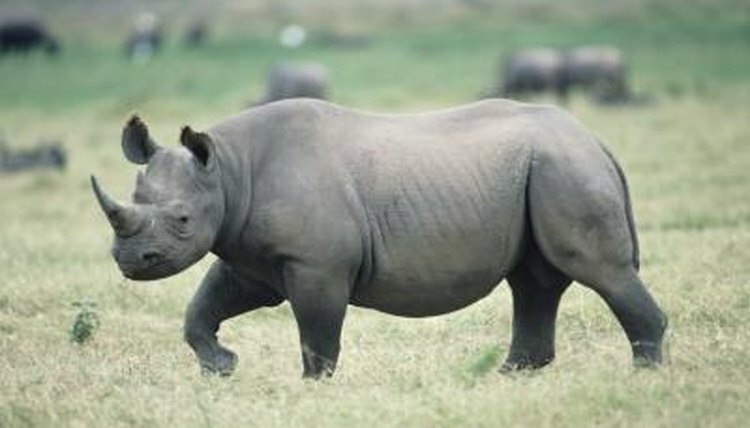 Consequently, white rhinos sometimes are referred to as "square-lipped" rhinos and black rhinos also are known as "hooked-lipped" rhinos. In black rhinos, the upper lip is prehensile, meaning it can be used to grasp objects, like buds and shoots. Contrary to what their names indicate, the hides of white and black rhinoceroses are a similar gray color. Both species have two keratin horns on their snout; the front horn is larger. The white rhino can weigh upwards of two tons and is the larger of the species. Black rhinos typically weigh between one and two tons. Black rhinos lack the prominent bulge that protrudes from the neck of the white rhino. Known as a nuchal hump, it is made up of muscles that allow the white rhino to lift its head after facing the ground to graze. White rhinos also have a larger skull and longer forehead than black rhinos. Though their ranges once encompassed a larger portion of the continent, today white and black rhinos are found in pockets throughout southern and eastern Africa. Their respective diets dictate where each species lives. White rhinoceroses inhabit open grasslands, savannahs and woodlands, where the terrain is flat and there is short grass for grazing. Because they rest in the shade to escape from the heat, white rhinos must have access to thick bush cover. Black rhinos prefer transitional areas between grasslands and forests where there are a variety of shrubs and leafy plants to eat. They also occur in deserts and, in Kenya, even in mountain forests. Both species tend to live near at least one water hole, which they drink from and wallow in to cool off. Black rhinoceroses generally hold their heads up; white rhinoceroses tend to keep their heads low, especially when resting. While males of both species, known as bulls, usually are solitary, female white rhinos are more gregarious and form more complex social structures than their black rhino counterparts. White and black rhinos have excellent hearing and smell to compensate for their poor eyesight. They charge when they perceive danger, which has given them a reputation for being temperamental. In this sense, the white rhino is considered less aggressive than the black rhino.